One of my favourite desserts of last year was the ‘Nanny Bush’s Trifle’ I had at Benedicts in Norwich. It’s a trifle, but not as we understand it. Trifles are supposed to be slopped into a big bowl, with soggy sponge base because it’s soaked with sherry amongst everything else. Not this one. 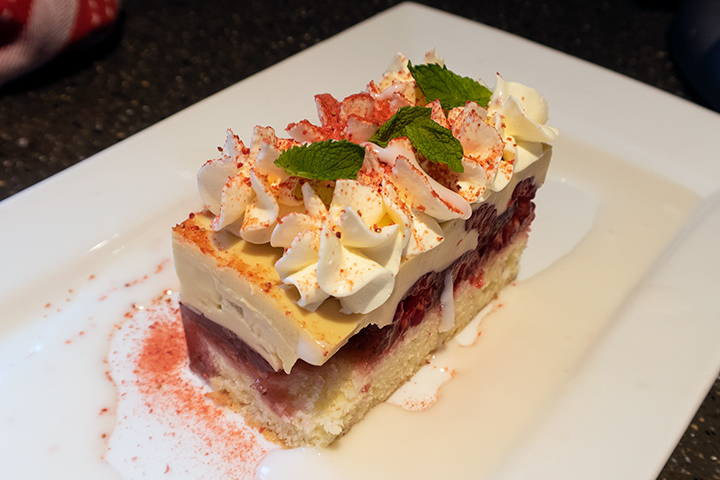 A neatly cut portion with the elements of trifle, the taste of the best trifle you’ve ever had, and no sogginess. I loved it, and noted down there and then that I wanted to make this - or something like this - at home. Cue the excuse - a birthday dinner I’d offered to put on. The one additional element of variation - the birthday was of someone who is seriously gluten intolerant and has a milder dairy intolerance. I was fairly sure that Richard Bainbridge’s recipe would be easily adaptable to cope. The dessert starts with a sponge base. No problem, gluten free flour can be substituted for plain with just the addition of a teaspoon of xanthan gum. Butter can be replaced by vegan margarine. You make the sponge base and then cut to fit a square shaped frame. First layer done. Next you add a layer of raspberries and make a strawberry jelly. This uses gelatine, so my version was dairy-free but not vegan. The jelly is left to partially set - just enough so it won’t soak into the sponge layer - and then it’s poured over the raspberries. It should go about half way up. Then it’s time for the custard. I used almond milk for this, mixed with eggs, sugar, gelatine and a little of that ol’ sherry. Again, you leave it for a little while until it’s begun to set before pouring it on the top to give a perfectly smooth final layer. Chill until fully set, and you’re nearly ready to go. To complete, you want to pipe some whipped creamy-something on top. Initially I tried a trick that’s out there on the internet - whipping the fat from tinned coconut milk. However, I had seen the recipe and thought I remembered it. Foolish fellow. I missed the fact that the tins and the bowl and the whisk need to be cold cold cold, so the fat thickens sufficiently to deliver the whipped results. I mixed the coconut milk fat with a little icing sugar and whipped and, although it thickened a little, it certainly wasn’t going to be pipeable anytime soon. Well, as noted, my guest of honour was only partially intolerant of dairy, so I was able to use the Elmlea cream substitute, which is a blend of buttermilk and vegetable fat, instead. It was sufficiently dairy-lite not to pose a problem in this case. However, if you’re doing it and want it to be fully dairy-free, you can just do what I didn’t - whip the coconut cream when it’s properly chilled. Mind you, sometimes accidents have positive benefits. The Benedicts version of this trifle had been served with ‘milk jam’ - a sort of very light dulce de leche. The only-slightly-thickened coconut cream was delicious and just of the right consistency to take its place. The final touches - a little dried strawberry powder to shake over the top and a couple of tiny leaves of mint. Voila - one classy trifle. And, even better, enough for left-overs the next day! Life is good. This is adapted from Richard Bainbridge’s ‘Nanny Bush’s Trifle’ - adapted principally to be gluten and mostly-dairy free, although I found I also had to mess around with some of the quantities (but not others) to make it work how I wanted it. There’s no reason why you couldn’t play with endless variations on this theme. If you’re ever in the neighbourhood of Benedicts Restaurant and it’s on the menu, you’ll find the original from the hand of the master himself remains unrivalled. I used a 25cm x 18cm frame for this, which gave enough to serve 8-10 people. First make the sponge. Put the eggs and sugar into a bowl and whisk until it doubles in size and reaches the ribbon stage. This should take more than ten minutes. Add the flour and gently fold in with a spatula. Finally add the melted margarine or butter and lightly mix in. Pour the batter onto a tray that is larger than the cake frame you’re going to use and bake for 8-10 minutes until cooked. Remove from the oven and turn out onto a cooling rack. Once cooled, place your frame or cake mould over it, and trim away the excess. Lay the remaining slice of sponge on the bottom and cover with the raspberries. To make the strawberry jelly, first make the syrup. Add the water and sugar to a pan, slice open a vanilla pod and scrape out the seeds and add the seeds and the pod to the mix, and then bring to the boil until the sugar has completely dissolved. Put to one side to cool. Once it has cooled, remove the vanilla pod. Place the gelatine in cold water to soften. Place the strawberries and the syrup in a bowl and cover with cling film. Place the bowl over a pan of simmering water for half an hour or so. Strain through a fine sieve into a clean pan, bring back to a simmer. Squeeze any excess water from the gelatine and whisk it in until dissolved. Once that’s done, take it off the heat and place the bowl over iced water and wait until it has partially set. Pour it over the raspberries and the sponge - it should go about half way up the fruit. Put it into the fridge to fully set. For the custard, again place the gelatine in cold water to soften. Bring the almond milk and the sherry to the boil and then take off the heat. Whisk the sugar and the egg yolks together until light and creamy. Add the hot milk mixture a little at a time while whisking, and then pour back into the pan and cook until the custard starts to thicken. Pass it through a sieve into a clean pan and then, once again, squeeze the excess water from the gelatine and whisk it in. Pour into a bowl and put over iced water and allow to partly set. Once it’s definitely on its way, pour over the strawberry jelly and the raspberries. You should have enough to fill to the top of the frame / mould. Put into the fridge and allow to set - ideally overnight. When ready to serve, remove the trifle from the frame / mould and slice into portions. Pipe your whipped creamy-something (or, indeed cream if you’re not doing the dairy-free thing) on top. Sieve some strawberry powder over, add a few mint leaves and serve. You use 100g egg yolks, which is about 5 egg yolks. That will, naturally, leave you with 5 egg whites. If you can’t use them within the next few days, then the best thing to do is to freeze them - egg whites, unlike yolks, freeze perfectly well. And, when you do so, put a note in the diary when you’re going to use them. Because, as we know, if you don’t have a plan, then you’ll be throwing them out in a year’s time. If you’re using the coconut milk fat trick, then you’ll need to freeze the remaining coconut milk. It will be less rich than usual because of the loss of the fat, but will do perfectly well stirred into a Thai or Indian dish for extra flavour. Freeze in portions suitable to be added to a meal rather than simply freezing the whole lot. If you think you’ll use it in the next few days, you can simply keep it in the fridge, but you should put it into a different container, not simply put the original tin in the fridge.